This is a continuation of an earlier post about a Bible study in which I’m facilitating and participating. Week One of the study concluded with the weekly gathering of the women to discuss our discoveries and takeaways and to jump into the Week 2 video lesson. It was a good one. Watch it, it’s only 20 minutes long! You can get an app for your phone at the web link above to watch the video for free. The video is powerful. The video got serious pretty quickly as Sandra wrapped up the first week of helping us to zero in on our tendency to compare, and Andy jumped right into letting us know what God really thinks of us. Some of the video content may have opened old wounds for some women, but for me, it was a reminder of how His presence can heal all of those wounds if we will only embrace His opinion of us. So, “where do we look to determine how we’re doing in life?” There’s a voice in our head that tells us to look around at others, and it convinces us that we need more of what others have in order to be acceptable, respectable and lovable. Andy Stanley took us to the Scriptures into Galatians 4:4-5 to talk about the law, rules, and the mirror which reflects that something is wrong. We all struggle to keep “God’s law,” but we struggle to also keep the standards we set for ourselves. On our own, we aren’t ok, and we never will be… there’s plenty around us to remind us of that. It’s yet another trap of comparison. But we’ve been redeemed for a price. We’ve been purchased by means of a trade. The value of any specific thing is the price that someone will pay for it. The images of the lesson made me really wonder what someone would “pay” to know me and have me in their life. What price would I bring? The only way to understand my true value would be to auction myself off to the highest bidder. That auction DID take place. I was redeemed for a very specific price, in a very specific way, by a very specific person. God sent His Son into this world to buy me back and to purchase me. He was the highest bidder. He did that for you. My faith placed in Him gives me the status as a daughter of God. I am the daughter of the living God. When God sees me, He sees a woman of great worth. Oh, how I struggle to believe and embrace this at times in my life, but renewing my mind to this truth—to His truth—and to how important I was to Him that He would purchase me with the price of His death on a cross… it is just overwhelming to think about. Instead of taking cues from those around me to determine how I am doing in life and to determine how valuable I am, I need to take my cues from the One who made me, loves me and redeemed me. I’m excited about the impact of the week to come during this study. The verses above from Day One of Week Two mean everything to moving forward toward more understanding. In the Devotional Book, Sandra suggested that we read them slowly to let their truths settle into our heart. Let His peace overwhelm you. Let His love wrap around you. For the longest time, I did not understand how this particular Friday could be labeled as good. No. None of this, I’ve imagined, could be good if I would have had to experience it. I didn’t have to, but I knew Jesus had experienced it all. How could it be that we’d wind up called this a “good” kind of Friday when He had to go through that? I attended a Presbyterian church as a child. Church was something we did on Sundays, and during my high school years, I also attended a youth group during most weeks. I was raised with good morals. We were taught to do the right thing, to fear and respect authority, to pray before dinner and bedtime, and to be good people. Sunday mornings at church were almost the same each week. Being there wasn’t the most enjoyable part of my week, but there were two particular services I especially looked forward to each year: the 11 p.m. Christmas Eve Candlelight Service and the solemn Good Friday service. The Good Friday church service was also known as the Tenebrae Service. “Tenebrae” is a Latin word meaning “shadows” or “darkness.” This service was different from any other during the Christian year because it was supposed to be very solemn. There were a few quiet hymns, readings about the events leading up to Christ being nailed on the cross, and sober readings from the Gospels (Matthew, Mark, Luke and John) about Jesus’ time on the cross. Much of the Tenebrae Service was done in dim light or candle light. Following the readings, the chancel area in the front of the church was stripped of the Bible, the offering plates, and the gold cup and plate. The candles were extinguished and the gold candlesticks were removed, and the cloths that covered the front table and pulpits were taken away. All of this was done in silence. Everyone would sit in complete silence while observing these items being removed from their places in the church. Then, we’d leave in silence. The lights were turned up just enough for us to see, but we’d all leave in silence. Complete silence. There were no greetings, no hugs, no handshakes, no well-wishes to one another. There was no Reverend to greet us as we’d make our way out the door. We’d just walk back the aisle, down the steps, out the door, and we’d get into our car to go home. The silence even continued in the car. The Tenebrae Service did have emotion. I felt the emotion, even though it wasn’t full of joy. The service always felt mournful. 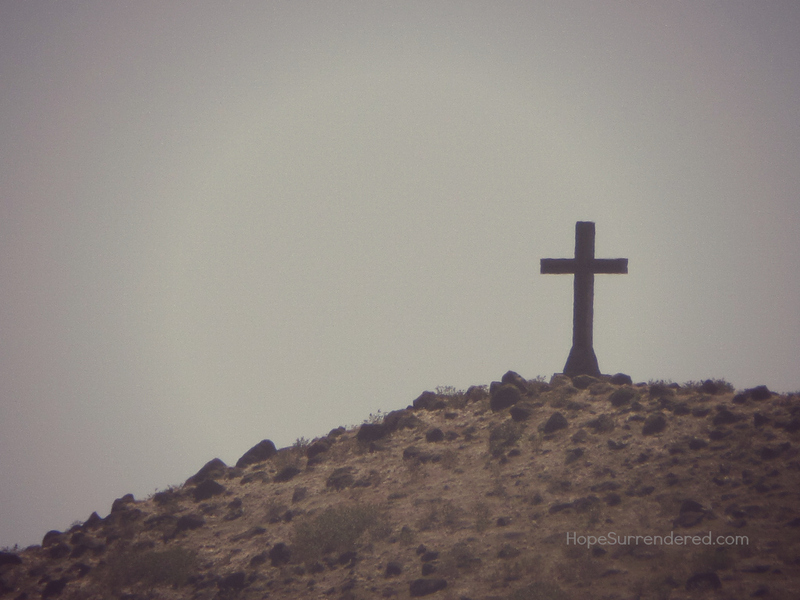 It felt dark and without light – a mere glimpse of what it must have been on that crucifixion day two thousand years ago. Jesus was nailed to the cross in the morning at about 9 a.m.** after enduring questioning, a trial and brutal beatings. Once that cross was set into place, He hung there until noon, at which point the skies overhead darkened. The darkness lasted for three hours, and around 3 p.m., Jesus cried out amid His suffering and suffocation to proclaim, “Tetelestai!” before giving up his spirit and breath of life. Most of us automatically equate the “it is finished” to His life, since, just moments afterward, His life was over on this particular Friday afternoon – the day we commemorate in remembrance as “Good Friday.” However, the “it is finished!” was much more than just a part of the final words he uttered in the final moments of His life before giving over his life and spirit. The “it is finished!” was His “paid in full” proclamation regarding our sin. That’s where the “Good” comes in. He suffered for us. 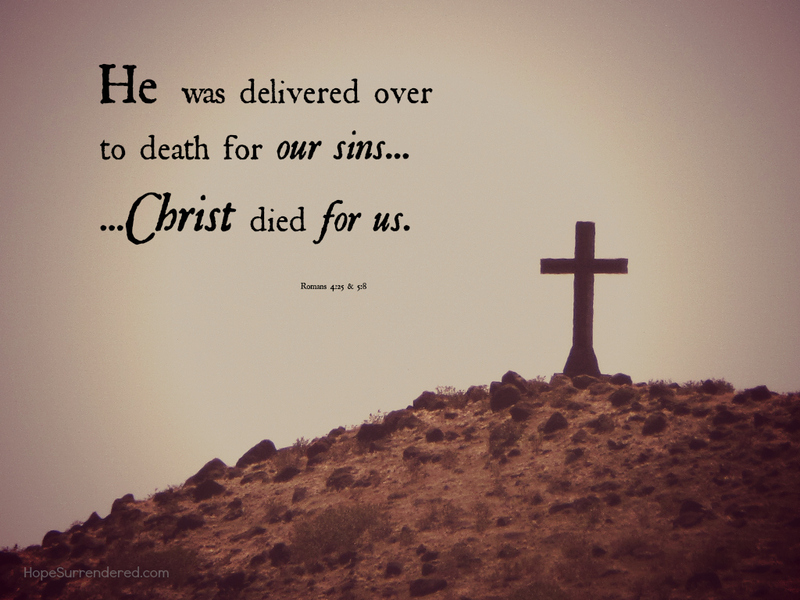 He demonstrated his self-sacrificing love for us and for our wrongdoings by dying for us (Romans 5:8). What He did for us once, does not have to be repeated by all of us (1 Peter 3:18) in order for us to live eternally in His presence (John 3:16). About 13 years ago, I went to a new church. On my first visit to this church there was a song sung by the congregation which stood out to me. I didn’t know it, so I didn’t sing it. I just listened. I didn’t understand what the words meant, but that song awakened something within me. I’ll never forget those words. An awakening within me had begun. I had come to that new church with questions, but now – after only one visit – there was an even bigger question burning within my mind…and in my heart. It was one that would lead to knowing what He did for ME, and one that would lead to me knowing HIM personally. You are welcome to download and share this image or others on the site. I only ask that you not alter the photos. The Gospels of Matthew and Luke use similar time designations (see Matthew 27:45 and Luke 23:44). This way of calculating time was based on the Jewish method, where 6 a.m. would have been the first hour of the day, so noon would have been the sixth hour and 3 p.m. would have been the ninth hour. It is believed the Gospel of John, which presents a different time for the start of the crucifixion, used a Roman method of time calculation, which would have started the day at midnight (John 19:14). There could have, however, been a three-hour period of time between his sentencing before Pilate (sixth hour) and time Jesus spent under the charge of the soldiers, time spent carrying his cross (John 19:17) and arriving at Golgotha where the crucifixion took place. Various commentaries show a consistency in these interpretations of time. I’ve used Sonic Light, The Bible Knowledge Commentary (see my Recommendations page on the last tab above) and Got Questions for my sources in this post.